So, if you follow me on facebook or instagram, you will be well aware by now of my TWO attempts over Australia Day weekend to make a naturally sweetened pavlova. I learnt many things from that little experiment, a key one being that if you are flying by the seat of your pants, scale it down! I planned a huge 10 egg white pavlova. And the first one failed miserably, so of course I had to try again. I didn’t perfect the pavlova that weekend (but the second attempt was far better than the first, so you better believe I will keep trying!). The point of this pavolva-spiel is that I had not ten, but TWENTY egg yolks for which to find some kind of purpose. Ten egg yolks (yes, ten!) went into an ice cream (a glorious ice cream, recipe coming soon!). Four egg yolks went into a custard. Two egg yolks went into my dad’s homemade mayo. 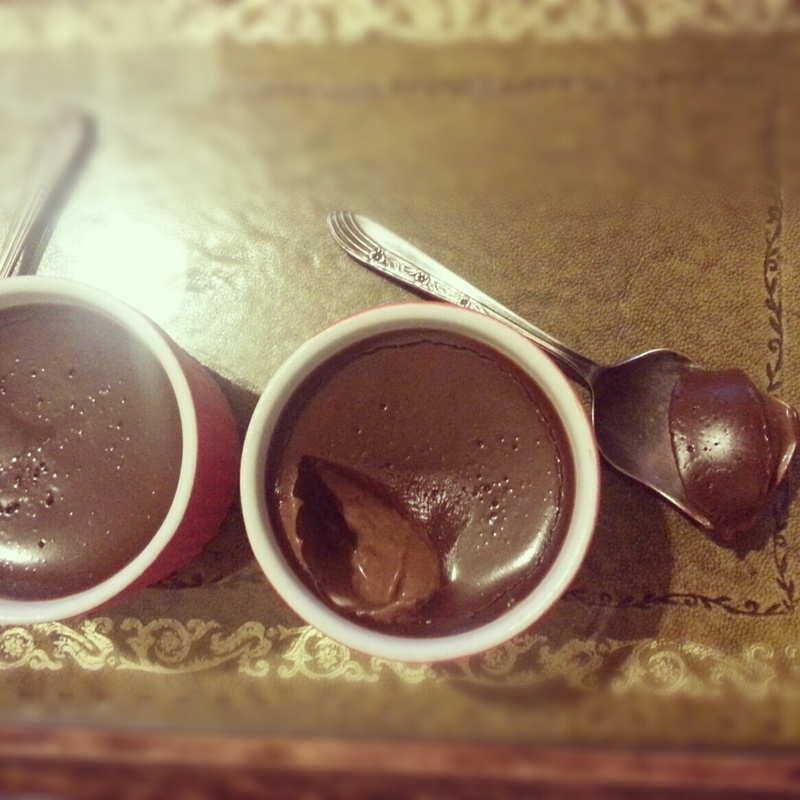 And the last four went into these delicious little ramekins of heaven – chocolate pots de creme. I like my chocolate bitter as all get out DAAAAARK. So, I hereby caution you – if you don’t like really dark chocolate, use the upper limit of honey in the recipe below. I made this without pre-made chocolate, for several reasons. Good, naturally-sweetened, soy-free, safe premade choc is expen$ive $tuff. I couldn’t be bothered to make my own choc to then use in a recipe. Sometimes a combo of cacao butter/cacao powder/honey is cheaper, easier, and better than using premade stuff. And I didn’t have any of my favourite premade choc in the house. Sometimes laziness is not a bad thing. Preheat your oven to 160 degrees celsius. Put 8x125ml ramekins in a big baking dish. Put the kettle on to boil. Weigh all ingredients into the bowl and cook for 5 mins, 90 degrees, on speed 4. Add an extra minute to the cooking time if it hasn't reached 90 degrees in 5 mins. Don't cook too long after the mixture reaches 90 degrees. When your very rich, chocolatey custard finished cooking, divide it between the ramekins. Carefully pour the boiling water from the kettle into the baking dish around the ramekins. Take care not to pour water into the ramekins. Cover entire baking dish with foil, and bake for 30mins or until starting to set but still a little jiggly. Pull the baking tray out of the oven and let them sit (loosely covered) for approx 10mins, then 10mins more uncovered or until cool enough to handle. Put your ramekins in the fridge and let them set for at least 8 hours, or overnight (although, probably not overnight.... this is not exactly breakfast kind of food). That looks amazing! Where do you buy your cacao butter? That is the first time I’ve heard of it. Hi Mindy. I live in Sydney, Australia and buy it from a local organic store called Organic Food Network. If you live in the US, you can buy it online here: http://amzn.to/1gwfTZY (affiliate link). Otherwise, check out your local health food store. Hi, I absolutely love this recipe! And that you are also a Sydney local. I made it for my valentine and he loved it! I replaced the cocoa butter with coconut oil and it worked. My question is, can the mix (before baking) be put into moulds to set as chocolate? No, they’re not firm enough to serve as chocolates. The consistency is more like a thick/firm custard. Glad you loved them!